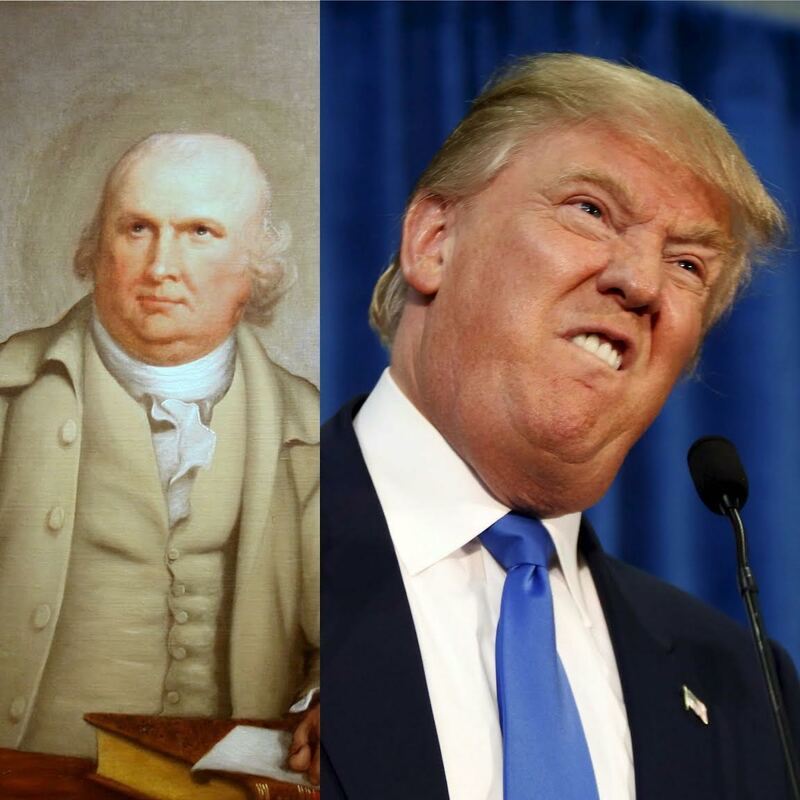 Profiles in History: America’s First Donald Trump? Did Robert Morris pave way for Donald Trump? You decide. Images via Wikipedia and Business Insider. Imagine, for a second, a wealthy businessman who “rarely hesitated to use either his wealth or his imposing physical presence to intimidate a business associate or a rival. Self-assured to the point of arrogance, he had little patience for those ‘vulgar souls,’ as he derisively labeled them, whom he did not consider his social or intellectual equals.” Next, imagine that this man is at the forefront of some of the most important decisions of the day, and you’d probably imagine Donald Trump at some point along the way. At least I did while I was reading about Robert Morris, one of the wealthiest men in America at the time of the ratification of the Constitution. People have often wondered if this election that we’re in the middle of is without precedent, and I think that that’s probably not the case, and the case of Robert Morris might help elucidate some of what’s been going on. The comparison is by no means perfect, but I think that the parallels are enough to at least consider them. After all, despite Trump’s insistence that he loves the poorly educated, there are reasons that people think that he is the most elitist candidate running for President. Morris is best known to history as the financier of the Revolution, but there are a few other things in his career that I found to be interesting. One of the most interesting roles he played was in fomenting what came to be known as the Newburgh Conspiracy, which was one of the most pivotal moments in the history of the nascent United States. After the American Revolution, the country entered what has come to be known as the Critical Period, and America lacked the means to pay many of the soldiers who had just fought in the Revolution. There was a reason for Morris allegedly to foment this rebellion, and it stemmed from his fury at the Articles of Confederation. After the Revolution, America was desperate to get its fiscal house in order, and Morris’s supporters, who “viewed him as the only man in America capable of bringing the country back from the brink of insolvency,” secured the title of Superintendent of Finance for him. In accepting it, he demanded sweeping powers not only over finance, but even over dealings with foreign countries! Although this title may not sound imposing, some have argued that since there was no measure providing for a chief executive under the Articles of Confederation that this is the closest America has ever come to having a prime minister. The unrelenting belief Morris’s supporters had in his ability to manage the country due to his success in business sure seems familiar to me. Even the way his critics “tended to view him as a man whose single-minded devotion to the pursuit of wealth and power led to business practices that were self-serving and dishonest” strikes a familiar note. I would make a joke about him having a university named after him, but there actually is a Robert Morris University in Illinois, and I’ve been there for an art show and can assure you that it is more functional than Trump University ever was (although that’s not saying too much!). It was great getting to welcome Past Forward, the first art exhibit from the United Arab Emirates to travel to the US, to Chicago with the best +1 in town! As Superintendent, he was desperate to right America’s fiscal ship, and the best way for him to do that was to use “a combination of his business expertise, his own considerable wealth, the strength of his personal credit rating, and the influence of his prominent and wealthy friends in the mercantile community” to halt “the spiral of inflation.” He “introduced up-to-date management practices in the conduct of the continental government’s financial business.” Morris was able to secure loans from the French and Dutch. There is much to be said in terms of the benefits of running a government like a business (which is one of the many reasons that I supported Mitt Romney in 2012), and that seems to be the approach that Morris took. In the same way that ideology is really not that important to Trump, Morris’s “hostility toward the Articles of Confederation owed more to a businessman’s desire for a government that protected and promoted finance and commerce than it did to any deeply rooted feelings about the character of ancient or modern republics.” That fact notwithstanding, Morris had deep seated hostility towards the Articles of Confederation, under which nearly everything had to be approved unanimously by all of the states. The loans he had acquired were not enough to run an entire country, and the US needed a constant source of revenue from the states, so Morris used “a combination of his forceful personality and his extensive financial leverage” to persuade the states to support an impost (which is a tax on imported goods). Under any other system, the levy would have passed, but Rhode Island, which had a history of shunning outside powers (has it lost that tendency? You tell me), refused to support it, with its leaders writing that it was “as clear as the Meridian sun” that once the central government was able to levy taxes such as this would “add the Yoke of Tyranny fixed on all the states.” Rhode Island’s opposition meant that there would be no real way to sustain the government without a drastic change, and this is where Morris’s leverage came into play. Upon learning that the soldiers at Newburgh were furious over the lack of payments to them, “Morris encouraged the soldiers to press their demands, and, having fomented a more rebellious mood, he spread the word to the Congress meeting in Philadelphia that ‘the army have swords in their hands’ and that a ‘most violent political storm’ threatened the very existence of the union.” This conveniently was used to support a stronger federal government, which is what Morris wanted all along, even though it temporarily frayed his relationship with none other than George Washington, who was able to quell the rebellion before it spiraled out of control. When Washington reached Philadelphia, he had no intention on staying with Morris, but he was greeted by Morris upon leaving his carriage, and was whisked away to Morris’s mansion in a way that seems all too reminiscent of Trump’s insistence that Hillary and Bill Clinton showed up at his third wedding because he was a donor to the Clinton Foundation. There’s no denying that Robert Morris played an extremely significant role in the creation of America, and I personally view him as a far more beneficial contributor to America than Trump most likely ever will be, but I leave the question to you. Was Robert Morris, the Financier of the Revolution, the first Donald Trump? If you want to learn more about Robert Morris, I highly recommend Plain, Honest Men, by Richard Beeman, which is what everything in quotes is from. Did Robert Morris pave way for Donald Trump? You decide. Images via Wikipedia and Business Insider.